It’s been a little more than month, since 17 year old Trayvon Martin was murdered. He was walking home with Skittles and an Arizona Ice Tea, talking to his girlfriend and getting back to watch the rest of the NBA All-Star Game with his family. If you’ve been following the news, you already know what happened. It was a rainy day. 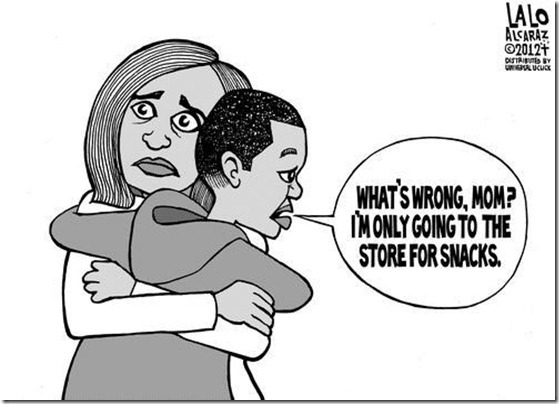 Trayvon was walking back to his father’s house with his newly purchased snacks. He was wearing a hooded sweatshirt. He was chatting with his girlfriend on his cell phone. And then George Zimmerman, neighborhood watchman, decided Trayvon looked suspicious. He followed him in his car and then on foot – directly going against the instruction of the 911 operator. There was a confrontation between them. Trayvon Martin was shot and died right there on the sidewalk, reportedly less than 100 feet from his father’s doorstep. One month after Trayvon Martin’s death. There is a petition that has been signed by almost 2 million people – click here to sign. There have been protests in major cities. This Sunday, people around the country wore hoodies to church, to symbolize what Trayvon was wearing when he was killed. George Zimmerman has not been arrested for the death of Trayvon Martin, because of Florida’s controversial “Stand Your Ground” law. Former Florida Governor Jeb Bush was the man who signed that law and even he says the law doesn’t cover this kind of murder. When I spoke to my mom about my feelings recently, she said this all reminded her of Emmett Till. And she’s not the only one drawing those comparisons. Cartoon by Lalo Alcaraz. Source, Twitter. This is around the point where I honestly don’t even know what to say anymore. Every time I sit and try to write about Trayvon Martin, the words get stuck inside me. I have started and stopped this blog post so many times over the last week. It’s been so hard to know what to say because this case makes me feel so hopeless and so sad, and so afraid for the future of this country. I hate the comments I’m seeing online. I’m hating the slant of some of the coverage I’ve been reading. I hate that people are finding ways to say that Trayvon’s sartorial choices made him a deserving victim. (Geraldo Rivera, your son is right to be ashamed of you. You continually use your platform to spew ignorance. And basically saying “If you’re offended, I’m sorry” does not a genuine apology make). Mychal Smith for The Nation – Justice for Trayvon Martin. Jen Wang on Disgrasian – Where The Killing of a Fictional Black Child Exposes How We Feel About The Killing of a Real Black Child. Jen’s piece directly connects to the dismaying racist tweets regarding the casting of The Hunger Games movie. Sinead O’Connor’s open letter to the family of Trayvon Martin. My Brown Baby — Black Boy Swagger, Black Mom Fear. Bassey Ikpi on xoJane – My Five Year Old Son is Afraid to Wear a Hoodie. In case you don’t already know, Bassey Ikpi is one of the best to ever do spoken word poetry, and she wrote an incredible poem for Trayvon. Here is video of her performing it. Right now this whole thing feels like a brick sitting on my chest. As a beauty and hair blogger, I’m supposed to be testing out products and featuring information about things that uplift and beautify. I’ve got all kinds of interviews and reviews backed up that I need to be working on. But it feels disingenuous and difficult, and with every article I read about Trayvon Martin – especially now with the new villainous and politicized slant that some are using to disparage the character of an unarmed teenage boy – I find more and more anger bubbling inside me. And I know I’m not the only one who’s angry. And confused. And scared for the future of this country. It’s all so heavy and ugly and upsetting. Not the kind of thing I like to write about on a blog that’s about beauty and positivity. So I will end this post with my hopes, regarding the outcome of this ongoing situation. I hope that the murder of Trayvon Martin doesn’t lead to any additional violence. I hope there is some form of justice and I hope it doesn’t take forever. The wheels of justice are already turning too slowly here. I hope we can channel our collective anger and sadness and grief into good. Into community work. Into getting out the VOTE this year. I hope we can raise our voices and not our fists to express ourselves. Trayvon Martin was not the first and he probably won’t be the last to be unfairly targeted and killed for the color of his skin. Ebony’s piece 10 Others Before Trayvon Martin underscores that awful truth. I just hope that Trayvon’s death will not be in vain, and I pray for some kind of peace for his family and closest friends. I’d love to hear your views, bellas. It was so hard expressing my own. « Beautiful Textures Review and Giveaway. Your Chance to Try My Faves! This piece is very well written and from the heart. It angers me to know it’s on such an ugly reality. Though it will not bring back Trayvon, my hope is for justice to the fullest extent to be served. When first learning of this tragedy, my mind instantly thought “If the roles were reversed, that Florida law would have quickly been overlooked and the black man arrested.” It is a shame our society still sees race in such a negative aspect. It’s a shame race still divides instead of unites. I agree wholeheartedly, let this not be a call for violence but a call for peace. This is the chance to show we, as a community, break all assumptions, stereotypes and low expectations. Here in France we had, last week, a man killed children in front of a Jewish school, to avenge “Palestinian children”… it’s not the same but it’s just to say that there is a resurgence of hatred.. is it the time or because these are electoral years in both our countries? Anyway this is unbearable, outrageous and sad! This was indeed a moving piece. I have a fifteen year-old nephew who has been a black belt since the age of seven. If a strange man accosted him, this kid would definitely do damage. Does that give the man a right to shoot my nephew? No. Did Trayvon Martin fight for his life when accosted by George Zimmerman? The likely answer is yes. Did that give him the right to end Trayvon’s life? No. No one’s life should be forfeit because simply they defended themselves. That is all. Thanks Patrice for writing this post. I cannot think of Trayvon without crying. The whole situation (we can’t even call it a case!) infuriates me. The fact that people would now bring the fact that Trayvon was suspended from school as some sort of defense, infuriates me. And it makes me so angry and sad that beyond signing a petition, there doesn’t seem to be any real way to funnel my anger at this whole mess. How can people justify this? How does a grown man pursue a young man against the 911 operator’s instructions, only to feel threatened enough to draw a weapon and use deadly force? I mean, it baffles my mind. And beyond Zimmerman’s racial profiling, the institutionalized racism that has kept Zimmerman from arrest and prosecution blows my mind. You have articulated everything all my sadness wont let me put into a coherent sentence. Thank you fr sharing your raw emotion. I can only hope that this tragedy can be used for good in ways that we simply cannot see now. Thanks for this, Afrobella. Another blogger who has written movingly about this is Los Angelista. As Marsha above states, the right to self-defense doesn’t just extend to the one with a gun. Who — of ANY color — would allow some stranger in the dark to approach them and inquire about their whereabouts in a rough manner without becoming defensive? Very good to see that such very serious issues are also broached and dealt with here. I send prayers for Trayvon’s family and friends. I hope that America in the first instance, and the rest of the world, STOP these racist assumptions and reactions. There is enough actual war in this world, our neighbourhoods do not need to be added. The loss of a young life is always tragic and I grieve for his family, HOWEVER, I feel it is irresponsible for certain “race baiters” to protest and declare things BEFORE the facts of the case are known. Daily, more things are being discovered about the case. It very well may be true that a HUGE injustice has been done. But to prematurely state that this was a hate crime, etc, does no justice to Trayvon or his family. For example, witnesses say that Trayvon was seen on top of Zimmerman, and Zimmerman told police that he was punched in the nose and had his head slammed on the concrete. Initial police reports noted Zimmerman had a broken nose and blood on the back of his head. Now this does NOT necessarily justify Trayvon’s death, but we need to get the FACTS, and then get the FULL CORRECT STORY before picking up the picket signs. As Black people, I know that we are quick to embrace being victims of “the Man”, but if we want JUSTICE, we must wait for THE FACTS. I’m all for not jumping to conclusions but let’s be real. NO ONE knows what really happened besides the two people involved. What I do know is that if Zimmerman did not approach an unarmed Trayvon at all, as instructed by the 911 operator, Trayvon would still be alive. The confrontation by Zimmerman was unnecessary, unwarranted and avoidable. And THOSE are all the facts that I need. “Injustice anywhere is a threat to justice everywhere”.~Dr.Martin Luther King ,Jr.It hurts becuz it could have been my nephew or child.It hurts that racial profiling still exists in this country.It hurts that some would rather turn their backs than see how wrong this tragedy is.It didn’t have to happen! I really do believe in each of the thoughts you could have displayed with your posting. There’re incredibly begging and can definitely function. Even now, the particular content are certainly brief to start. May you please prolong these individuals a little bit by the very next time? Appreciate your publish.